HÀ NỘI — A research and training institute for digestive, liver and bile diseases was established in Hà Nội on Sunday. The institute is equipped with the most advanced technology. Đào Văn Long, former director of Hà Nội Medical University’s Hospital and one of the institute’s founders, said up to 70 per cent of the Vietnamese people were infected with Helicobacter pylori, bacteria causing acute and chronic gastritis and stomach cancer. Việt Nam also has more than 10 million people infected with chronic hepatitis B and C viruses, leading to hepatitis, cirrhosis and liver cancer. Four out of 10 most popular cancers are related to the digestive system. They are liver cancer, stomach cancer, colorectal cancer and oesophagus cancer, Long said. According to health experts, Việt Nam’s changing weather conditions, unhygienic food habits and pollution are conducive factors leading to digestive diseases. 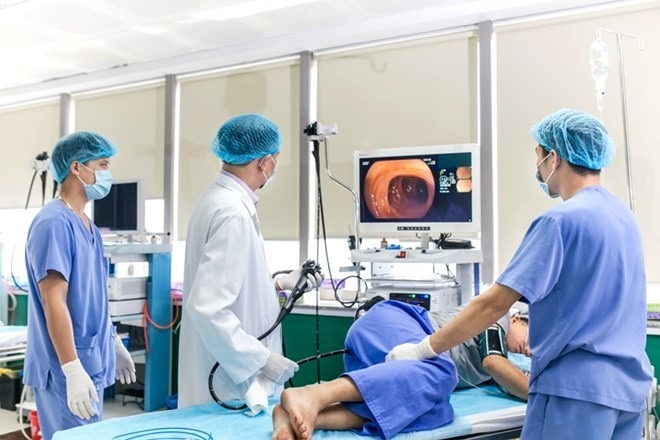 Patients who visit Bạch Mai Hospital and Hà Nội Medical University’s Hospital for a check-up of their digestive system account for 35-40 per cent of the hospitals’ total number of patients every day. Very few province-level hospitals have a separate department for digestive, liver and bile diseases, Long said, adding that there were huge gaps in healthcare services related to digestive, liver and bile diseases in Việt Nam and in the world. The research and training institute, under the management of Việt Nam Union of Science and Technology Associations, will be responsible for training high-quality medical workers and conducting scientific research to propose solutions and apply the latest techniques in preventing and treating digestive, liver and bile diseases.